 Rat anti Human c-myc antibody, clone JAC6 recognises the myc proto-oncogene which is frequently used to tag proteins, and is the same epitope recognised by clone 9E10. c-myc is also known as Transcription factor p64 orClass E basic helix-loop-helix protein 39. Amino acids 408-439 corresponding to the C-terminal region of human c-myc. Smith, G.D. et al. (2002) TRPV3 is a temperature-sensitive vanilloid receptor-like protein. Dawson, K. et al. (2008) Loss of regulators of vacuolar ATPase function and ceramide synthesis results in multidrug sensitivity in Schizosaccharomyces pombe. Eukaryot Cell. 7 (6): 926-37. Tetzlaff, J.E. et al. (2008) CHIP targets toxic alpha-Synuclein oligomers for degradation. J Biol Chem. 283 (26): 17962-8. Shin, Y. et al. (2005) The co-chaperone carboxyl terminus of Hsp70-interacting protein (CHIP) mediates alpha-synuclein degradation decisions between proteasomal and lysosomal pathways. J Biol Chem. 280 (25): 23727-34. Liebig, T. et al. (2009) RhoE Is required for keratinocyte differentiation and stratification. Mol Biol Cell. 20 (1): 452-63. Lozano, E. et al. (2008) PAK is required for the disruption of E-cadherin adhesion by the small GTPase Rac. J Cell Sci. 121 (Pt 7): 933-8.